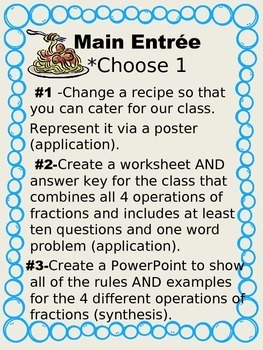 Students have the opportunity to choose which assignments they would like to complete in Menu Math. 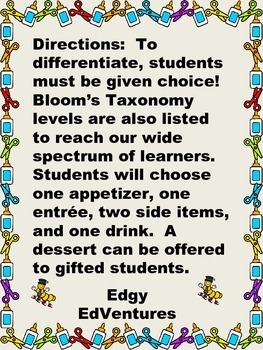 They will complete 1 appetizer activity, 1 main entree activity, 2 side items, 1 beverage, and 1 dessert (I assign this particular one to gifted learners only). While creating this, I focused on the four different types of learners, in addition to Bloom's Taxonomy. 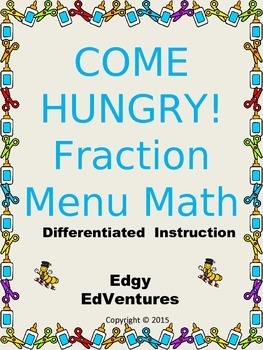 There are choices for every type of learner in Menu Math! 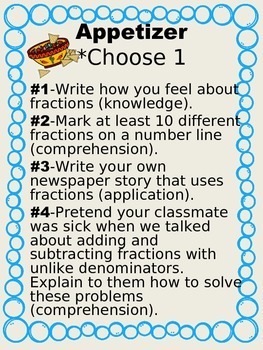 This activity requires students to have previous knowledge with addition, subtraction, multiplication, and division of fractions.